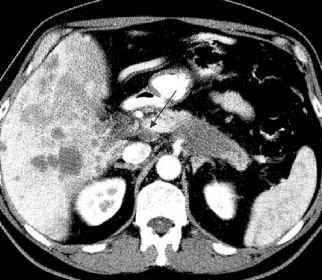 In general, diagnostics of inflammatory and tumorous pancreatic conditions rely on imaging such as US, CT, MRI and - more invasively - ERCP). Imaging findings are ruled by the macro-structural changes of the organ and its surrounding. Calcifications in CP can easily be depicted using plain films and US. Additionally, US is able to display ductal dilatation, micro- and macrocystic changes, and the gland itself. Contrast-enhanced multidetector CT (MDCT) is well-established to assess ductal changes, calcifications, the form and shape of the pancreatic gland, and potential concomitant conditions such as pseudocysts. This also enables multiplanar, curved reconstructions for a highresolution display of the total gland and the run of the duct. Depending on the fibrotic changes in CP, contrast enhancement can be variable by CT, whereas most ductal carcinomas present no or only minor enhancement during arterial-dominant- and parenchymal-phase imaging. However, late enhancement can be seen on delayed imaging without substantial additional information. Beside the superior tissue resolution for the differentiation of varying 'qualities' of pancreatic parenchyma, using unenhanced and Gd-DTPA-enhanced T1-weighted sequences (± fat suppression) and heavily T2-weighted sequences, MRI is capable of best displaying the pancreatic gland and the pancreatic duct, including first-generation side arms and small stones. Nevertheless, ERCP does show initial ductal changes (Table 4) superior to all other imaging modalities, but the clinical significance of these minor changes remains contentious, compromised by the fact of potentially 'unphysiological' distension of the ducts by contrast medium injection. Pancreatic cancer (PCa) is the most crucial complication in CP and is the major challenge for diagnostics because focal enlargement of the gland induced by a fi-brotic inflammatory pseudotumor may be indistinguishable from pancreatic carcinoma. According to the recent literature, a comparison of state-of-the-art MDCT and MRI reveals no difference in the detection rate of PCa. Nevertheless, CP is still the major factor for a missed diagnosis due to its potential tumor-like appearance. However, if local or regional lymph node enlargement, vascular encasement, or remote metastases are displayed, the differential is ruled by these secondary signs of malignancy. Then, it is most important to stage the tumor correctly to allow for further treatment stratification (Table 2, 3). In ambiguous cases, biopsy or even surgical exploration may still be necessary. CP can cause a focal pancreatic mass indicative of a neoplasm. Moreover, CP represents a major risk factor for PCa with a 26-fold increased risk of developing cancer, according to an international, multicenter cohort study . Therefore, the differential between CP and PCa is still challenging, stressing a variety of methods. The sensitivities and specificities of US, CT, and MRI for PCa were reported as 76-83% and 91-93%, respectively. Nevertheless, the rate of incorrect diagnoses is still up to 25%. Using various differential criteria (Table 5) may help to improve the overall diagnostic accuracy beyond pure image interpretation. Recently, new methods and techniques for discriminating between CP and PCa have been described, these include the oxygen insensitivity test, FDG-PET or in vivo proton MR spectroscopy, in addition to conventional pathologic studies of brush cytology. Nevertheless, in general, these new methods are not yet well established [40, 41].